Car insurance over 50 is a funny thing. For a time you are viewed like a fine full bodied wine, improving with age with a wealth of experience, reliable stock that should be rewarded with lower premiums. However as you creep through your 70s and 80s, some of those car insurance companies, once eager to welcome you as a customer start fall by the way side preferring should we say a slightly younger vintage ! In short over 50s car insurance has a tipping point. 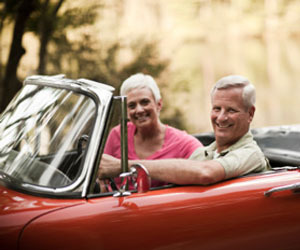 If you are over 50 or 60, fly the flags as cheap car insurance could be yours for the taking. Over 60 car insurance, 70s and over 80s I’m afraid are considered a greater risk so in a similar way to young drivers insurance, your premiums will start to creep up. Don’t be too down hearted though, all is not lost. Some companies specialise in car insurance for the more mature driver with no maximum age limit whatsoever, so cover should be available. Whats more regardless of your age, whether you are over 50, 60, 70 or 80, there are a number of ways you can look to reduce the price you pay. You’d think that by the time you hit 50, with potentially years of experience behind the wheel, car insurance would be quite cheap, but that’s not always the case. Car insurance for over 50 premiums can still prove to be a significant expense, and while women might have enjoyed cheaper cover than men over the last 18 months, that’s all changing thanks to some new European legislation. Here we look at how you can find the best over 50s car insurance deals. Car insurance premiums are weighted in favour of drivers who pose the lowest risk of making a claim. Drivers who have less driving experience, who drive expensive or powerful vehicles, who have driving convictions or who live in high-crime areas tend to pay more for their insurance because of the increased likelihood of them claiming for an accident, vandalism or theft. The best example of this is how teenage drivers tend to have the most expensive insurance because they generally have the least driving experience and are statistically more likely to be involved in an accident (and make a claim) than older drivers. By contrast, older drivers with many years’ driving experience and possibly no claims discount (NCD) tend to be rewarded with cheaper cover than younger drivers. Of course even experienced drivers can face higher premiums if they drive particularly expensive or powerful vehicles, because claims statistics may show that the type of car they is more likely to be involved in an accident or be stolen. The cost of repairs could also be more expensive. Men are also statistically more likely to be involved in accidents than women, which has always meant they paid more for cover, but all that was changed in December 2012. New legislation from the Europe court of justice bans insurance providers from discriminating on the grounds of gender. For car insurance, this means that the disparity between men and women’s premiums is going shrink. Ideally, this would result in men’s premiums falling to the levels previously enjoyed by women, but in reality it means car insurance is becoming more expensive for women, while men are seeing just slight price drops. Alongside the gender directive is the Continuous insurance enforcement (CIE) rules, introduced in 2011, which mean any vehicle not officially declared as no longer in use with a Statutory off road notification (SORN) must be insured at all times. So if you have a vehicle you rarely use, and tend to only take out insurance for those infrequent periods where the vehicle is in use, you’re going to have to either declare the vehicle SORN when you’re not using it or simply start insuring it all year round. The combination of these two pieces of new regulation means the cost of driving could be going up for some drivers, making it more important than ever to make sure you shop around to get the best possible price for the cover you need. Fortunately, there are some things you can do to combat these changes and keep over 50s car insurance costs down. It can prove a false economy to scrimp on cover in order to get a cheaper car insurance quote. However there are things you can do to ensure you get the cover you need at the right price. Paying your entire premium up front, rather than spreading the cost over monthly instalments, for example, will save you money. This is because the insurer will charge you interest if you opt to pay monthly. Committing to a higher voluntary excess should also earn you lower premiums, but you should only ever set it to a realistic amount you’d be capable of paying, because if you have to make a claim you will have to fork out more. Increasing the voluntary excess by say, £100, is unlikely to cut the same amount off your premium so you need to think whether it’s worth the risk of saving a bit now if it could cost you more later should you have to make a claim. Securing your vehicle with additional, insurer approved antitheft devices such as steering wheel locks or immobilisers can bring your premiums down, as can keeping the vehicle parked in a secure location overnight, such as a locked garage. Work out your annual mileage, many people over estimate the number of miles they drive each year but insurers charge a higher premium to those who are on the road more as they’re at greater risk of being involved in an accident. There’s no point in paying more than you need to. Finally, make sure you shop around for over 50 car insurance UK cover using online comparison site, instead of accepting the renewal quote from your existing insurer each year, as there are likely to be savings to be made elsewhere.